Measurements from Maps: Principles and Methods of Cartometry describes the accuracy of a variety of measurement techniques that may be used in many fields of science, administration and travel. This book is composed of 23 chapters, and begins with a description of the nature and applications of cartometry. The succeeding chapters deal with methods of measuring distance and area, sources of measurement errors and their analysis, cartometric sampling, the concept of accurate map, and the magnitude of cartometric deformations. These topics are followed by discussions of aerial photograph measurements and the precision of different methods, as well as their suitability for different kind of work. This book also looks into the probabilistic methods of distance measurement, and the geometrical, planimetric, and point-counting methods of area measurement. 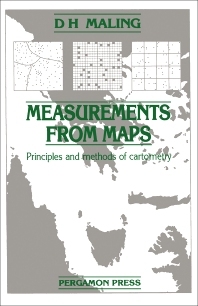 The last chapters consider the application of digital computer in cartometry and the measurement on Mercator's projection.